Are you looking for a refrigerant management system that offers superior mobility and user-friendly features? 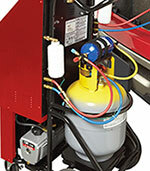 Best Buy Auto Equipment has all your needs covered with the Flo-Dynamics FLO1000 R134a A/C Service Machine. This innovative recovery, recycle, and recharge system is the preferred choice of professional technicians who demand intelligent self-diagnostic capabilities and quality manufacturing. As one of the industry-leading brands in automotive fluid exchanging equipment, Flo-Dynamics has earned a reputation for reliable A/C equipment that always performs. At the heart of every FLO Series system are the patented motorized ball valves, which eliminate the use of solenoid and check valves in the recovery and evacuation flow paths. Both of these components are highly susceptible to failure when they are exposed to foreign contaminants, such as aftermarket A/C sealants or dirt. Fortunately, the patented motor-controlled ball valves significantly improve flow rate and reduce possible obstructions caused by contaminants. With a patented high-speed oil-less compressor, the Flo-Dynamics FLO1000 R134a A/C Service Machine ensures fast and accurate recovery, recycling, and recharging of drained air conditioning systems. What sets the FLO1000 R123a A/C Service Machine apart is its attention to the needs of technicians. The user-friendly interface can support multiple languages and units of measurement, dramatically simplifying operation and eliminating the guesswork at every step of the way. What’s more, each Flo-Dynamics FLO1000 R134a A/C Service Machine comes fully equipped with flow control technology and a 6 CFM PRO-SET vacuum pump, allowing you to evacuate systems up to 50 percent faster. We offer interest-free financing options for up to six months and free shipping on this product! Complies with SAE J2788 & SAE J2788H standards for High Voltage A/C systems.